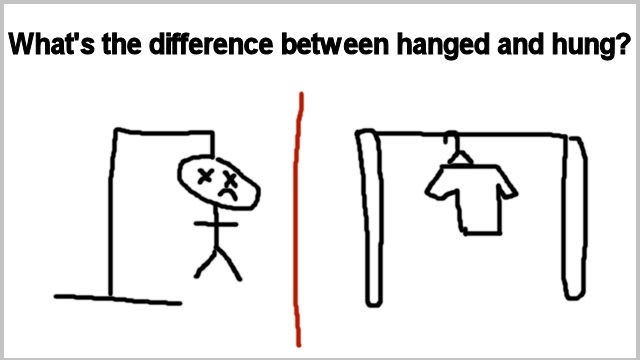 Have you ever wondered what the difference between hanged and hung are? I was reading some history articles the other day (yes, I am a nerd), and noticed that the word hanged was used often throughout the articles. At first, I thought you can use the words hung and hanged interchangeably, where both had the same meaning, but some people just preferred to use one over the other. However, I wasn’t so sure that was the case, so I decided to do some extra research on it (again, I know I am a nerd… leave me alone). I found out that, though the two words are past-tense versions of the word hang, they are used for different occasions. Hanged is used when the hanging is going to cause death or that death is the goal. So if I were to say a person was hanged, that means that the person died via a hanging. Here is an example: On April 15, 1778, rebellion Jacob Smith was hanged for causing a violent riot that resulted in the deaths of 12 people. The word hung, on the other hand, is the regular past-tense form of hang. If you are describing something that was put up, such as a poster on a wall for instance, then the word hung is the correct one to use. Here’s an example: Teddy hung up an awesome poster of Michael Jordan yesterday. Here’s another example: Bob slipped on water and fell over the side door of the boat. He hung at the edge, waiting for someone to pull him up. So to recap these two words, the word hanged is only used when the goal of the hanging is to cause death. The word hung is used as the regular past-tense of hang. Additionally, I also want to talk about commas for a bit. So there seem to be people who are often confused, I find, about how to use commas to break up items in a list. Take this sentence as an example: I want you to buy me eggs, milk, and bread. Notice that comma before the word “and”? Many people are not sure if that comma should be there or not. I was confused about it too, so I did some research on it (yes, yes, I am a nerd. Get over it already). What I found was that it doesn’t matter if that comma is there or not. Both ways of writing a list are correct. However, whichever way you choose, you have to continue to use that way for your entire writing. It has to be consistent. So there you have it. 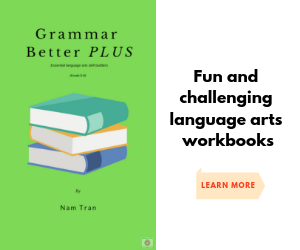 I hope this article cleared things up for you and helps you improve your writing. 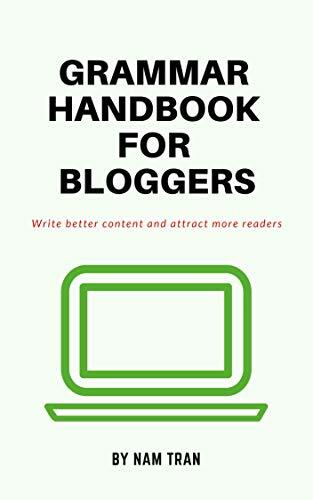 If you want to learn more grammar rules, check out my book, Grammar Handbook for Bloggers. You can click here to head over to the product page on Amazon.